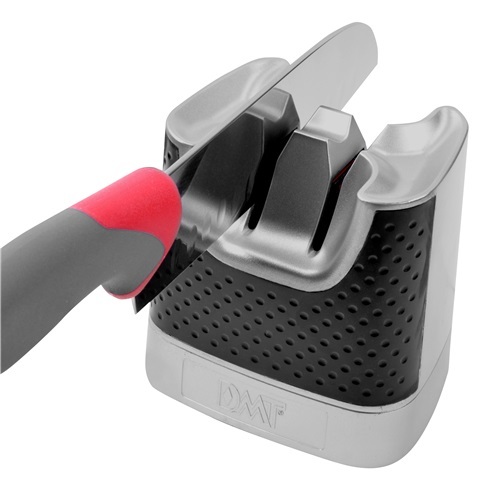 Attractive counter model (4 3/8" x 3 1/2" x 4 3/8" ) providing sharpening assist without a plug! Operates on 2 AA batteries. Blade openings accommodate most common sports and kitchen knives. Vibrating sharpening heads facilitate sharpening. Sharpening surface 20mm x 30mm (.7874" x 1.181"). Fine diamond (red/600 mesh, 25 micron) for a razor sharp edge. Sharpeners made in USA; other components made in China. Counter model for kitchen or bench 4 3/8" x 3 1/2" x 4 3/8"